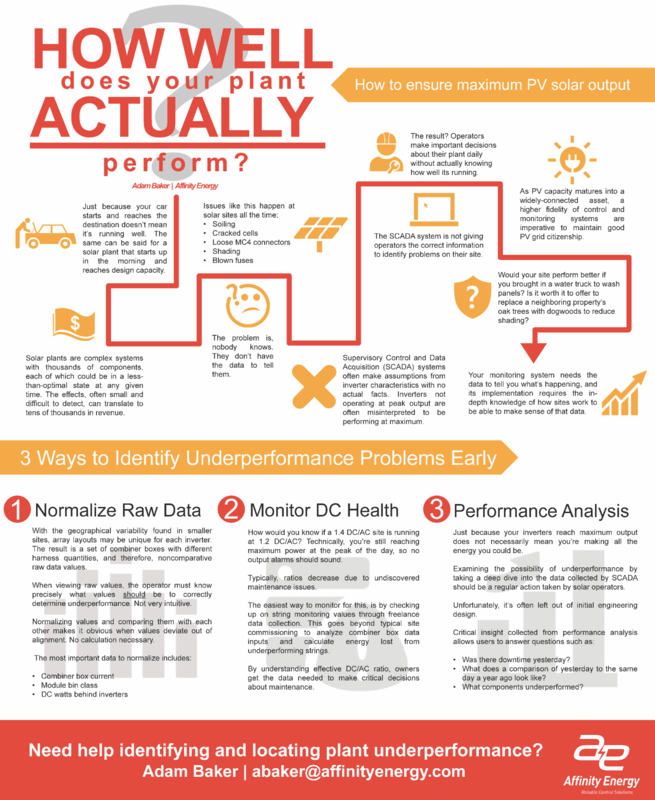 PV Performance: How Well Does Your Plant ACTUALLY Function? Just because your car starts and gets you to your destination doesn’t mean it’s running well. The same can be said for a PV solar plant that starts up in the morning and reaches design capacity. Is it actually running well? Would your car perform better if you used the platinum split tip spark plugs, in place of the OEM spark plugs? What about replacing the air filter more often? Most operators make important decisions about their plant daily without actually knowing how well its running. Inverters not operating at peak output are often misinterpreted to be performing at maximum. SCADA systems often make soiling assumptions from inverter characteristics with no actual facts. Solar plants are complex systems with thousands of components, each of which could be in a less than optimal state at any given time. The effects, often small and difficult to detect, can translate to tens of thousands in revenue. The experience and expertise to find these conditions should be based on actual data from your monitoring system, not inferred from changes over time. But what I’m talking about goes way beyond just having an onsite SCADA or controls/monitoring system. To ensure optimal and maximum PV solar output, you really need to conduct thorough performance analysis. This enables you to drill down and investigate factors that could cause performance decrease. Although SCADA can have some capabilities to generate reports and plot trends, it’s not doing analysis. Because SCADA is a real-time application, it conducts real-time trending, or historical trending when connected to a historian. Usually, the trends it plots are a linear graph of plant output vs time. A user can scale the graph to as few or as many days as they want to see, but the graph will simply show a single line of output over time. Days over time do not overlap, so it’s difficult to compare or see subtle differences from day to day. What does a comparison of yesterday (Thursday) to last Thursday look like? What does a comparison of yesterday to the same day a year ago look like? The best way to see this data is through data normalization. Basically, normalization is the act of taking raw data and adjusting it based on other values or percentages onsite. Properly normalized raw data presents a better overall picture of site performance. When would it make sense to bring in a water truck to wash the modules? Should we skip the drone IR analysis? Should we cut a deal with the property neighbor to replace his 80-year-old oak trees at the back of his property with some fresh new dogwoods? Your monitoring system needs the data to tell you what’s happening, and its implementation requires in-depth knowledge of how sites work. To make sense of the data, reach out to a control system integrator with solar-specific experience to slice and dice the data into actionable to do’s. Your long term solar plant revenue may count on the conclusions found through this analysis. 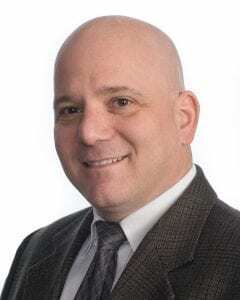 Adam Baker is Senior Sales Executive at Affinity Energy with responsibility for providing subject matter expertise in utility-scale solar plant controls, instrumentation, and data acquisition. 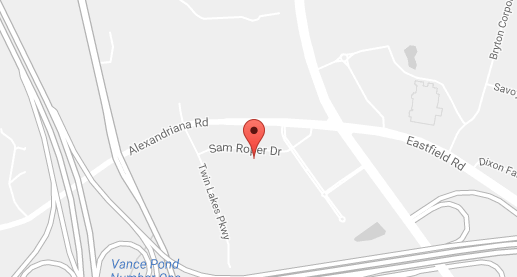 With 23 years of experience in automation and control, Adam’s previous companies include Rockwell Automation (Allen-Bradley), First Solar, DEPCOM Power, and GE Fanuc Automation. Adam was instrumental in the development and deployment of three of the largest PV solar power plants in the United States, including 550 MW Topaz Solar in California, 290 MW Agua Caliente Solar in Arizona, and 550 MW Desert Sunlight in the Mojave Desert. After a 6-year stint in controls design and architecture for the PV solar market, Adam joined Affinity Energy in 2016 and returned to sales leadership, where he has spent most of his career. Adam has a B.S. in Electrical Engineering from the University of Massachusetts, and has been active in environmental and good food movements for several years.